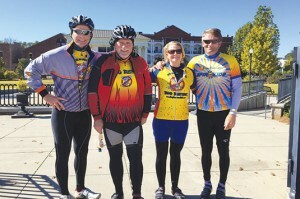 Court Parker participates in triathlons and races to stay fit and focused, and support the community, too. Keeping fit is a way of life for Court Parker. The COO for Atlanta-based Bug Busters USA has participated in triathlons since he was 10 years old. Twenty-nine years later, he’s still at it — although he’s cut back on the frequency. “Now I have a 5-year-old, a 3-year-old and a 1-year-old, so it’s dropped off dramatically,” he says. He participates in about three triathlons a year, in addition to races he enters with his workout buddies, his kids and wife, Devon, or his dad and sister. “I always have workout clothes with me, everywhere I go,” he says with a laugh. You can reach PMP Managing Editor Diane Sofranec at dsofranec@northcoastmedia.net or 216-706-3793.